Welcome to DJ Mix Pro, the smart jukebox for Windows. DJ Mix Pro is designed to let you choose the songs while it performs by itself quality cross fading, beat matching mixes between songs. DJ Mix Pro has built in Beatlock Technology, that makes it beat-aware. This technology does not alter your sound files, it just analyses them to find the BPM. Knowing the beats, it is able to perform high quality DJ mixes. You just have to fill your playlist and it´s done ! You can optionnaly edit the mix position and length, listen to it in your headphones to check you like it. 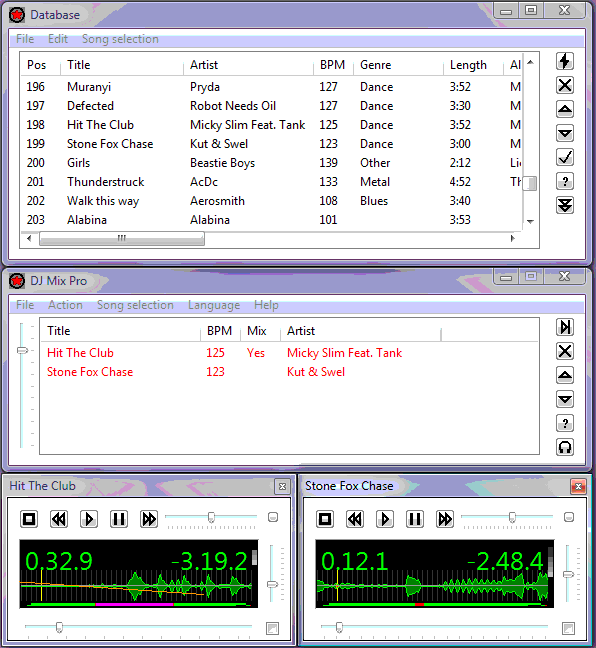 This is the ultimate DJ program for parties.